FEDAGA is at the start of a programme of discussion with the City of Edinburgh Council as they seek to (1) raise more revenue from the allotment service and (2) draft a third Allotment Strategy Document for the years 2016 to 2020. ​Here is a brief summary of the points currently being discussed by FEDAGA and the Council’s team, led by the Head of Parks and Greenspace. FEDAGA stated they would not support rent increases in the budget although a fairer method of charging concessions was discussed. This could be based on Council Tax banding to calculate a fair charge for anyone due a concessionary rent. Clarification of allotment spending over last 5 years reveals that additional costs have been included that were not budgeted for five years ago. A consistency of approach is essential to plan ahead. Those on the current waiting list should be contacted to find out what size of plot (full, half or a smaller 'growing space') they want when they are eventually allocated somewhere. This will both help understand the challenges created by Community Empowerment but also the make-up of sites to be created. FEDAGA volunteered to compose the question. This opportunity for greater flexibility would also include current plotholders if they wished to up/down-size. To facilitate this, a register of plotholders’ desired plot size could be created. Future new sites will be created by identifying suitable land, then contacting everyone on the waiting list nearby to form an association and get the site built using grant money. Sites would be encouraged to be self-managed. It was agreed that sites created this way were more likely to be valued by the plotholders rather than the current situation. Golf courses are being investigated to provide suitable land. Trade Waste uplifts are likely to be discontinued across the city in the near future therefore no more waste collection from allotment sites. Some alternative needs to be found if this comes to pass. Lots of discussions over 'dirty plots’, or - if you prefer - badly maintained plots. They are the main contributor to the contents of the waste bins when someone clears out someone else's old shed and accumulated junk. They are also the main source of pests and disharmony among plotholders on a site. The new Allotment Strategy may include a refundable 'bond' when a plot is taken on. If it is in an acceptable condition when vacated then the bond is refunded, if not it pays to sort out/clear/tidy up the plot. This could also possibly be charged annually for all plotholders. Pest control can't stop as plotholders don't have skills or permissions to do it themselves. We need a better definition of what is an acceptable plot so that the new Allotment Strategy can set parameters for the training of volunteers doing site inspections. Other Councils’ allotment rules would be investigated to see how others define this. Creation of a database of skills on sites - so that minor repairs can be done by plotholders. There will be insurance and health and safety issues to resolve. Due to data protection rules, the welcoming of new potholders cannot be done by site representatives. A compromise is to produce some form of information leaflet or letter which gives an introduction to the site and has contact names. This would be given to new people. If they want to be shown around and introduced to the site they can get in touch. If they want to be left to their own devices, they can be. Water harvesting to be encouraged. Composting education to be promoted. FEDAGA asked the Council to consider bringing forward the issuing of invoices from January to November as it seems the arrival of this demand often encourages uncommitted plotholders to relinquish their tenancy. The present arrangement means that the growing season is often well underway before the plot is reallocated. Starting this process earlier may mean new plotholders are established in better time to take advantage of the growing season. Here is a Report on the Special General Meeting held on Tuesday 10th November 2015 to discuss and form a position on City of Edinburgh Council initiatives affecting allotments. 17 sites were represented by about 40 members: Bridgend, Cambridge Avenue, Carrick Knowe, Claremont Park, Craigentinny, Dumbryden, Ferry Road, Hutchison Loan, Inverleith, Lady Road, Midmar, Pilrig Park, Restalrig, Saughton Mains, Stenhouse, Warriston, West Mains. The meeting was chaired by FEDAGA President, Peter Wright. The recent Allotment Survey was noted, the results of which would inform the 2016-2020 Allotment Strategy. The main item of interest is the level of rent and what allotment holders get for this. There is a clear need for financial transparency if a 5 year plan is to be agreed. Over the last 5 years the Council’s own allotment budget is claimed to have grown from £61K to £101K. Currently, with expenditure at £80K there is a shortfall of £21K. The Budget Proposals for 2016-17 call for a rent rise of 10% to provide £10K and curtailment of waste removal and pest control services to provide £11K. This will make the service break even. FEDAGA maintains that after a steep rent escalator to 2014 allotment holders should be enjoying a rent freeze to 2020. Although the Council does not indicate any further rises after 2016-17 it is uncertain what may be proposed in future years. One purpose of the Strategy is that it should show what can be expected in the short to medium term. It should enable the Council and allotment holders to plan ahead. understanding of the situation indicates that when the axe falls it will hit everyone. How this is managed is ultimately up to Councillors, but it is hoped that FEDAGA can inform and influence their decision. How is the level of rent justified? Whether or not allotments should enjoy a subsidy is another matter, but assuming that income equals expenditure then the question of what costs it incurs should be examined. The Council argues that operating and capital costs should be reflected. The operating costs are reasonably clear, but the capital costs are less so. It is claimed that these constitute £61K in repayments for creation of new allotment sites. How this figure was arrived at is unknown. Cllr. Lesley Hinds, Convenor of the Transport and Environment Committee, has stated that this should not form part of the annual running cost of the service. It would be helpful to have a discussion informed by what the operating and capital costs are and have an agreement on what costs should be borne by allotment holders. It is expedient for the Council to have allotment holders pay for loan repayments, but it is not politically justified. FEDAGA should negotiate to remove the capital component from the Council’s figures. Future allotment provision should be made on a minimal cost basis. Supervision of operating costs should become more transparent. It is likely that if there is better liaison with the Council then costs could be driven down. Although working an allotment is now often viewed as a “lifestyle choice” rather than an economically essential means of food provision for the “working poor”, many argue that it provides fresh organic food of known provenance that is otherwise unobtainable. Some who are on good incomes state that they would happily pay more while others are barely scraping by and view a further increase in rent with genuine horror. Implementation of further rent rises will exclude sections of society from allotments. There may be a case for increasing the rent as, judging by the poor state of many plots, many are insufficiently valued. If the cost rose then more care may be taken over them. If there was an efficient way of accurately judging how much people could afford to pay it would have been introduced before now. Means testing is a necessarily bureaucratic answer and one that, given the likely need for an appeals system, is unlikely to be pursued. Perhaps people who are able to pay more could be asked to forego their concession when they qualify for it. It is apparent that, by default, this already happens as those over 60 currently should be on a 50% concession and many are not aware that they can apply. The Council has for some time been boosting its income by not writing to allotment holders when they reach age 60. Trends indicate that the age profile of allotment holders will rise slowly, adding a little more than 1% every year to the cost of the concession under the current system. An increasing number of those over 60 are still in employment and the proposal to move the age of qualification to receipt of the State Pension is difficult to argue against. However, many allotment holders of working age do not qualify for a concession while their income may be a lot less. Additionally, there are large groups such as carers who are denied a concession but have an extremely limited income. The meeting was divided on the issue of means testing. Although it is seen as essential to ensure fairness the impracticability of administering it would defeat implementation. One suggestion that might be worth looking at would be to apply a concession to allotment holders who are in receipt of Housing Benefit or Council Tax Reduction. The Council will have access to this information. It was agreed that if there is a change to the age at which a concession is awarded it should not be retrospectively applied. Those that currently enjoy such a concession should not have it taken away from them. It was proposed that a concessionary rate of around 80-90% be awarded on age grounds which can be appealed if circumstances suggest 50% is more manageable. It must be recognised that the health benefits of working a plot and subsequent reduction in cost to the NHS will likely outweigh savings made by applying a rent that prevents allotment holders from continuing into old age. The Council seems keen to reduce its involvement in managing allotments. It has explored outsourcing management responsibility but this has not been taken forward. The Survey indicated most want the Council to retain its responsibility. The crucial question is - how much is the Council prepared to pay to reduce its management role? If management responsibilities are devolved to site associations, by how much will this be reflected in a rent reduction? There has been a marked reluctance amongst the majority of allotment holders to embrace devolved management. If it is to work, the Council must make it appear worthwhile. Sites such as Wester Hailes, largely Council-owned but independently managed, have a completely different ethos from that on Council- managed sites. The missive of let can stipulate that the tenant participates in site activities and takes their turn on the Committee. The rent on such sites is typically from a third to a half of the Edinburgh Council charge. Independently managed sites are eligible to apply for funding from bodies such as the Climate Challenge Fund. By way of examples the Killandean Allotments in Livingston and Cultybraggan Allotments in Comrie should be considered. However, it is one thing to set up a new site under such a system but an entirely different matter to change the prevailing culture on a long-established site. If devolved management is pursued it must be done gradually. The Council must address its obligation under the Community Empowerment Act to reduce the waiting list for allotments. The number of applicants on the waiting list should be no more than 50% of the number of available plots. The current ratio in Edinburgh is 200%. The maximum time that anyone should wait for a plot is 5 years, whereas many sites have an estimated 9 year waiting time. Provision of new sites will simultaneously address this need and raise income when plots are let out. It is suggested that to make this feasible, the Council should identify potential land and alert those on the waiting list and in the locality of the possibility of starting a new site from scratch. It should then be up to the applicants to form a site association and arrange for the basic amenities, primarily fencing, to be installed. Help for this will be available in the form of expertise from bodies such as SAGS and FEDAGA, and financially from environmental grants. apparent that there is an inconsistency of approach, as on a few sites this still happens as before - specifically Bridgend, Pilrig Park and West Mains. It is recognised that with an ever increasing number of plots and plotholders to manage, the task has become beyond the means of one individual. It had been proposed that FEDAGA nominate a team of volunteers who, with appropriate training, will carry out inspection duties on sites where they have no connection. However, this has not been adopted as the Council is concerned that there may be issues of bias. On a show of hands half of those present at the meeting indicated they would be willing to participate in such a volunteer-led inspection system. Communication, as usual, is the key. Allotment holders should contact the Allotment Officer if, for any reason, they are unable to look after their plot adequately. Site Associations should also keep in touch with their members via e- mail or telephone. Allotments are communities and should be able to help one another. To help those for whom the task of working a full plot is becoming burdensome there should be a system where they are encouraged to take a half plot. Similarly, new plotholders could start on a “nursery” bed as happens at Inverleith. There should be more provision for flexibility so that people work what they can manage. The Council propose to cut £11K from the cost of waste removal and pest control. As this roughly equals the current expenditure on these items this effectively means cessation. glass. At the very least, the Council should be responsible for ensuring a vacant plot is let in a reasonable condition. Some sites are badly affected by pests. Inverleith has had a rat problem which was more recently eclipsed by a plague of rabbits. Much can be done by allotment holders not trying to compost food waste and turning their compost bins regularly. If foxes are present, they may predate the rabbits. On a show of hands about 80% indicated that they would accept a reduced waste removal service as long as there is a commitment by the Council to ensure vacant plots are cleared of all debris prior to reletting. There was unanimous support for a continuation of pest control measures. As allotments are administratively part of the Parks Department and access to parks is free why do we pay extra? We already pay Council Tax. As Edinburgh Leisure gets a large subsidy, swimmers and golfers benefit. If allotments were transferred to Edinburgh Leisure we might qualify too. Parks enjoy the support of Friends groups. Perhaps there should be Friends of Allotments as well. Community outreach. As it seems likely Site Associations will take on more responsibility for repairs and maintenance there is scope for a reduction in costs if allotment holders’ skills are utilised. But there will also be a need for third party insurance. Extra work for allotment holders should see a rent reduction, but how realistic is that? £300 deposit for a key would ensure that on ceasing to be an allotment holder the key is handed back. The money would be retained if the plot was not left tidy. Evicting those who don’t or can’t manage their plots properly might reduce the waiting list and lessen the urgency to establish new sites. BRIEFING NOTE FOR EDINBURGH COUNCIL PLOTHOLDERS: FACTORS THAT WILL AFFECT EDINBURGH ALLOTMENTS IN THE FUTURE - issued 29th October 2015 in preparation for the Special General Meeting reported above. There are gathering pressures which will change the way allotments are run in the city, primarily from UK Government austery measures and the effect this has on Local Authority finances, and also the Scottish Government’s Community Empowerment Act. FEDAGA negotiates with the City of Edinburgh Council on behalf of all affiliated Site Associations and has called a Special General Meeting at 7.15pm on Tuesday 10th November to be held in the Southside Community Centre so that the Site Associations can provide feedback. The purpose of this article is to pick apart the various factors and give some background information so that an informed discussion may be had. The Council’s proposed budget for 2016-17 contains proposals for the allotment service. Rent will rise by 10% and concessions based on age will be delayed from the present age 60 to receipt of State Pension, which is calculated to save £11K. In addition, two services, waste removal and pest control, will be curtailed to save a further £10K. As this sum pretty much equals their current budget we are effectively facing termination of these services. FEDAGA and the Council agreed a 10 year plan in 2009 that saw annual rent for a full plot rise from £60 to £100 and be held steady from 2014 to 2020. Thereafter it was expected that rises would be in line with inflation. FEDAGA is strongly mandated by members at its 2014 and 2015 AGMs to maintain this position. However, FEDAGA recognises that the 50% concession for those over 60 may need to be looked at again. Not many services, free bus passes excepted, are so generously subsidised and many allotment services in other Council areas do not enjoy any such age-related concession. In addition, FEDAGA and the Council recognise that the age profile of allotment holders is steadily rising and this means an increasing cost in maintaining the current position. The Council says there is a £21K shortfall in the allotment budget and the Parks and Greenspace Department have been told to remedy this. Even if FEDAGA persuade the Council not to raise the rent - already by far the highest in Scotland - it would be improbable that the allotment service can emerge unscathed. The Council has chosen to cut waste removal and pest control as these represent the main costs that, being provided by a third party, are outwith their control. They argue that it will be much more difficult to influence the cost of services they provide in-house. The Council, having explored other possible solutions for managing allotments, and despite the Survey’s strong support for continuing Council management, is considering a form of devolved management. To begin with, the Council may suggest that any new sites that are created will be administered by the Site Association. This would enable the new site to obtain external funding for essentials such as security and water provision. At the 2015 AGM arguments in favour of sites taking over responsibility for maintenance and repair were aired. Involvement in governance issues, such as terminating leases, was rejected. It seems likely that a phased introduction of devolved responsibility for certain functions to Site Associations will be required. FEDAGA is of the opinion that if this happens there should be a proportionate reduction in rent for plotholders on these sites. It is recognised that the history of Site Associations’ involvement in the policing of plot standards and the necessary eviction of plotholders has been an unhappy one. This area will not be considered suitable for devolution at this stage. The Council and FEDAGA have over the past decade agreed two consecutive Allotment Strategy documents, known as “Cultivating Communities”. The third, covering 2016 to 2020 is about to be formulated. This will contain management models, rents, updated site regulations and missives of let - all open to discussion now. The Act is favourable to allotments and imposes some obligations on Councils. For instance, a Council is required to maintain a waiting list for allotments and ensure that this does not exceed 50% of the available plots and take longer than 5 years for a plot to be provided. The City of Edinburgh Council is badly falling down on this with a waiting list roughly at 200% of the available plots and on some sites the waiting time is 9 years. 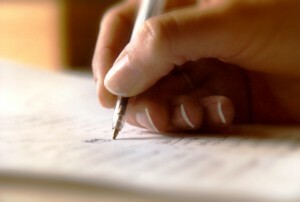 With the Act in place new regulations and missives of let can be written. It is fortunate that this opportunity coincides with the development of the third Allotment Strategy. Site Associations have been asked to arrange meetings if possible, or seek opinions from as wide a range of members as possible. Where there is no association, members are asked to contact their Site Representative to have their say. If there is no other option, members can contact FEDAGA directly, at committee@fedaga.org.uk There will be further material designed to inform and stimulate debate posted at www.fedaga.org.uk and issued in the November edition of the FEDAGA Newsletter. All members are invited to ensure their voice is heard either by these means or by attending the Special General Meeting. 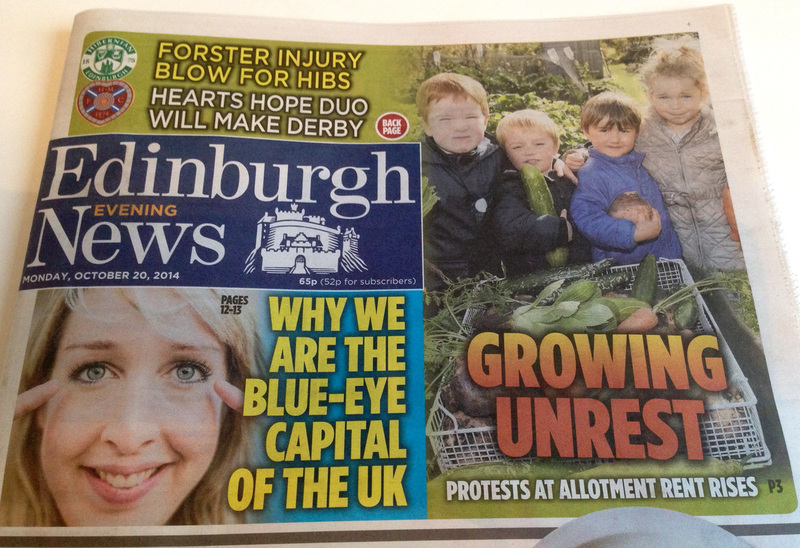 The 2014 campaign to prevent the City of Edinburgh's massive hike in allotment rents was successful. The rest of this page is now of historical interest. Many Councils from across Scotland and the rest of the UK are watching what happens in Edinburgh. Anyone seeking to prevent a similar threat to allotments anywhere is welcome to use the arguments put forward here. https://you.38degrees.org.uk/p/edinallotments Why not do both? Scroll down below the graph to see FEDAGA's official response to the proposals. FEDAGA has also obtained legal advice from a retired solicitor whose special area of expertise is in the agricultural field. He has brought his knowledge of Crofting Law and the Scottish Land Court to bear on Allotment Law with very interesting conclusions. This is a summary of his position. The full version, published in the December 2014 issue of the FEDAGA Newsletter is shown at the foot of this page. Any plotholder who is invoiced for an increased rent of the level proposed would be entitled to refuse payment. Section 10 of the Allotments (Scotland) Act 1950 states that land let as an allotment shall be let at a “fair rent”. The proposals under review ignore this stipulation. FEDAGA has calculated that the average full plot can provide food to the value of £300 per year. Against this we calculate that expenses of £112 (seeds, fertiliser, equipment, etc.) should be deducted. The resulting margin is £188. After this, one should calculate the amount of time spent on working the allotment. Even at a rate considerably below the minimum wage, this margin would vanish. To arrive at a “fair rent” the margin should be split between landlord and tenant. This follows the procedure employed by the Scottish Land Court. This would result in a fair rent for a full plot of £94. The Council’s Acting Head of Service - Environment, Jim Hunter, has stated that last year the cost of administering the allotment service fell short by approximately £1400, or slightly less than £1 per plotholder. Thus a fair rent properly calculated in accordance with the statutory duty by which the Council is bound falls in the range of £94 to £101. Please take time to read page 83 of their budget proposal (or look at the text reproduced on our News page). Allotments were created for the poor following the Enclosures Acts which steadily stripped common land from ordinary people. The Enclosures started in England in 1604 and accelerated in the 19th century. In response to this the Allotments Acts from 1892 placed a duty on Local Authorities to provide land for the growing of food according to demand. The City of Edinburgh Council has a statutory duty to provide allotment land. Today it provides 1,429 plots, a number which is rising partly due to the practice of halving existing plots and partly because provision is being increased. There are 2,730 people on the waiting list. In recent years the Council has worked in partnership with FEDAGA to improve the level of service to allotment holders and to increase the allotment estate. It is still a Cinderella service - and will probably always remain so - but the standards we enjoy would be the envy of many citizens elsewhere. In Aberdeen, for example, allotments have no fences, water supplies or even an allotment ofﬁcer. All allotments in Dundee are entirely run by volunteers. Allotments in Edinburgh are not subsidised. The money generated is mostly used to provide services to allotment holders and maintain the infrastructure. If the proposal goes through, the extra £150,000 will be used elsewhere. Can the Council use allotments as a source of income? It’s highly questionable. They must be affordable and available to all sections of society. If allotments become a source of proﬁt they exclude the very people they were created to help. The proposal is against the ethos of allotment provision and will be detrimental to efforts to promote social inclusion, good health and sustainability. Despite working on two successive 5-year Allotment Strategy Programmes, known as Cultivating Communities, from 2005 to 2015 the partnership FEDAGA has worked hard to create failed to stop the Council from throwing a bomb at the allotment community. Plotholders and Council ofﬁcials read in the pages of the Evening News of the intention to raise an additional £150,000 from the allotment “service”, on top of the present £80,355 income. A senior Council ofﬁcial told FEDAGA that he “had been instructed to not not consult on this or any other savings proposal until elected members had contributed to the discussion”. He apologised that allotment holders had to ﬁnd out through the media. £80,355 is generated from 1429 plotholders. 326 plotholders pay £100 for full plots. 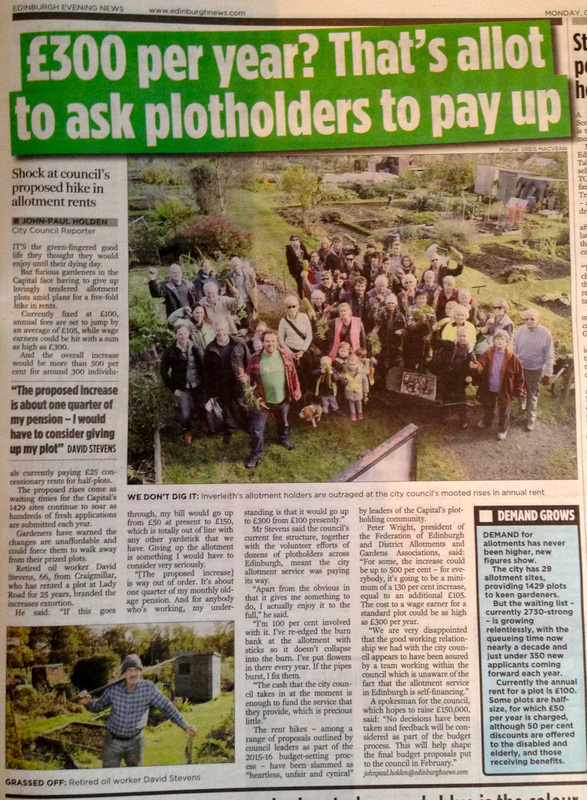 396 plotholders pay £50 for half plots. 407 plotholders pay £50 for full plots on 50% concession. 300 plotholders pay £25 for half plots on 50% concession. To raise the additional £150,000 each plot/half plot will suffer an increase of £105. There are two ways to apply the increase. If you’re on a concession and rent a half plot you will have to pay £130 every year. That’s more than a 500% increase. Would it be considered fair to raise parking charges or bus fares by over 500%? Those on concessions with a full plot would face a rise of over 300%. Those without concessions are not so badly affected. A full plot would attract a rise from £100 to £205; just over 200%. A half plot would rise from £50 to £155; over 300%. So, those with the least face a 500% rise, while those with the most suffer to the tune of 200%. Scenario 2: Maintain the 50% concession. This would be the more likely outcome. If 50% concessions for the disabled, elderly and beneﬁts recipients are retained the rent for a full plot could rise to £286.80. This model is illustrated in the graph below. Whichever way the cake is divided the proposal is unfair, unreasonable and unequal. supported bus services. All these services affect a massively greater number of people than the small number of citizens who look after an allotment plot. None are welcome. All should be opposed. But the allotment service is clearly being singled out. Why? The Budget proposal hopes to make savings of £28.5m. Hugh Dunn, the Head of Finance says that the exercise is to “improve services”. However, if enacted there will be few plotholders able to afford £300 a year for their plot. Perhaps the Council thinks that with a waiting list so large that there are 2 very patient people waiting on average 9 years for every plot, then they can employ market forces and ramp up the income. More likely, much loved allotments will fall into disuse and be sold to builders. Another tidy proﬁt for the Council! Or the 17th Century Enclosures on repeat. Glasgow charges £35 (concessions £25) and the average charge in England is around £60 (from £40 in Liverpool to £80 in Brimingham). It’s difﬁcult to get comprehensive and up-to-date ﬁgures, but across the UK, Edinburgh is at the top of the pile for expensive allotments already. Most other councils subsidise their allotments. It’s illegal. The Allotments Acts clearly state the Council’s statutory obligation to provide allotments at a fair rent where there is a demand. The huge waiting list demonstrates there is a demand in spite of the high prices. Elsewhere, councils that have attempted to raise allotment charges by similar amounts have been over-ruled in court. Increases must be in line with those applied to other recreational amenities provided by the council. The Consumer Contract Regulations 1999 prevent a landlord from imposing an arbitrary rent increase. In addition to all this, the proposal comes during a period of sustained goodwill which has greatly beneﬁted the Council. It is debatable whether the allotment holders of Edinburgh have enjoyed reciprocal beneﬁts. When one considers the above it might be tempting to think “it could never happen”. Indeed, the proposal may just be an ill-judged piece of kite ﬂying to see what the Council might get away with. But the only way to ensure that the proposal is withdrawn will be for every allotment holder to engage in the campaign. FEDAGA will be meeting councillors and ofﬁcials. This will count for very little if it is not backed up by each and every member. The most effective method is to personally engage with your local councillor. Try to meet with them at their surgery. Failing that, write to them. Letters are much more effective than e-mails. Remember that each ward has 3 or 4 councillors, so try to engage them all. There’s a style letter that can be used, below. However, the most effective communication is in your own words. You could also get in touch with your Community Council and ask them to support the campaign. The “engagement process” runs until 19th December. Final decisions will be made in February 2015. What if the Council decides to go ahead? A judicial review would be a very expensive option. A rent strike may be laudable, but in breach of the law. Quarterly payments are provided for in the Allotment Acts. It would inconvenience the Council no end if we were to make our payments on a quarterly basis. And they would not have access to the money in advance. But it would be best to avoid these consequences and nip this nonsense in the bud now. 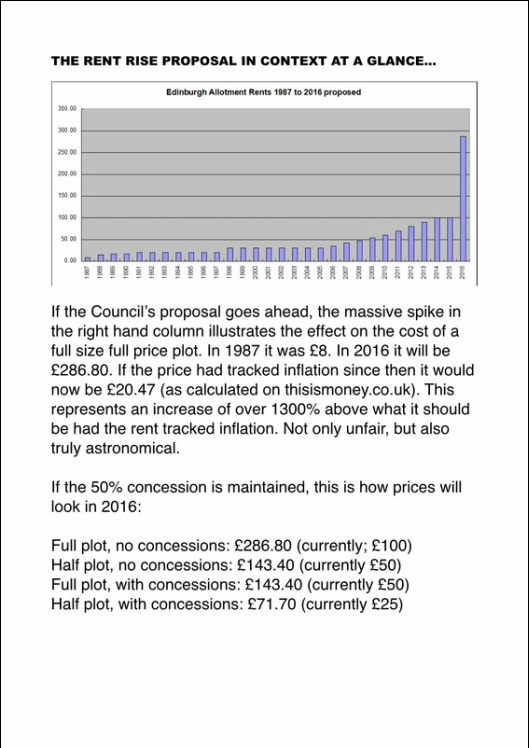 I write to protest against the City of Edinburgh Council’s proposal to increase allotment charges, as detailed in the Budget Proposals for 2015-16. It is the Council’s intention to generate an additional £150,000 annual income from the allotment plot-holders over and above the current amount of £80,355. In some cases this may result in a 500% rise. None of this additional income will be spent on improving allotments. The rent charged for an allotment plot has increased from £60 to £100 per year over the last 5 years. This has allowed the Council to make their allotment estate fully self-funding. The mechanism for this increase was agreed between the Council and the allotment community’s representative body, the Federation of Edinburgh and District Allotments and Gardens Associations. The agreement was for a rent escalator which reached £100 this year, to be followed by a 5 year period during which the rent would be held. In 2020 the rent would be varied in line with the rate of inflation over the previous 5 years. This agreement, reached in 2009 between FEDAGA (acting on behalf of the plot holders of Edinburgh) and the City of Edinburgh Council, constitutes a legally binding contract. By enacting the provisions of the contract, the Council is obliged to hold the rent as it currently stands until 2020. Aside from the proposed breaking of contract by the Council, the Allotments Acts (Scotland) 1892, 1922 and 1950 state a “fair rent” is to be charged for an allotment garden. The proposed charges will take the cost of renting an allotment in Edinburgh to a figure approaching 10 times the national average. Such a proposal is clearly grossly unfair, and therefore subject to legal challenge. I call upon you to remove the provision relating to allotments from the 2015-16 Budget Proposals. needs to make up a significant budget shortfall but disagrees that simply raising rents is the answer. We further realise you haven’t in fact defined specifically how the additional £150,000 will be raised. money and provide a better Allotment Service. improvements to allotment use to suit your budget timescales. increase revenues from Allotments in the city by £150,000. Allotments Service to benefit allotments, allotment holders and our Council. allotment sites, both for its citizens and to generate more income. ensures that prospective plotholders are committed to taking a plot. prior investment in allotments over the years. time is increased when councillors are involved in appeals. consisted of smaller raised beds as opposed to the traditional 250 square metre plots. therefore feel a sense of ownership and value on their smallholding. aspects of the Allotment Service. Services have a thriving volunteer service, why not Parks? couldn’t afford the extra and become disadvantaged. rental where people could pay more? seem a fair approach to take. condition on termination the deposit would be returned. Read coverage of the campaign in the Evening News. FEDAGA has obtained some interesting legal advice which bolsters our position. Please take the time to read it and, should you wish, use elements of it to persuade the Council to see sense. It would be a shame for such an indebted organisation to waste more money in the courts - which is what would happen if they don't take their proposal off the table. The Council cannot give effect to this proposal as it is illegal for them to do so. Any allotment holder invoiced for an increased rent of the level proposed would be entitled to refuse payment. In addition, the Council will be subject to judicial review of its decision. Similar attempts by local authorities in England to impose illegal rents have been struck down by the Courts. Neither the description of the “savings proposal” nor the “potential impact of service outcomes” make any reference to the fixing of a fair rent or demonstrate that the Council have applied their minds to carrying out their statutory duty to determine what a fair rent is in the circumstances of the Edinburgh allotments. The English cases make it clear that it is the duty of the local authority to fix, in a clear and transparent way, the rent properly payable for allotments. In order to assist the Council, FEDAGA have calculated what a fair rent should be. In order to determine what is “fair” one must first consider the purpose of the allotments legislation is. The purpose of allotments is to allow working families to put nourishing food on their tables at a price less than the cost of buying similar food in a shop or supermarket. The typical cultivable area of a full allotment garden in Edinburgh is approximately 150 square metres, after deducting from the gross area land used for pathways, sheds and storage. From this vegetables and fruit will be produced. We have calculated that the cost of buying the equivalent amount of food in a low cost supermarket is about £300. In order to produce this amount of food the gardener has to incur costs of cultivation amounting to £112, including seed, fertiliser etc. This leaves a margin of £188. The gardener has to devote considerable time and effort to working the holding. If these hours of labour were to be remunerated, even at the minimum wage this margin would vanish. Fairness in fixing the rent requires that this margin should be split between landlord and tenant, taking account of the provision of the land by the Council and the labour of the tenant in cultivating it. The proper division of the margin between the parties has been the subject of considerable discussion in cases relating to the fixing of croft rents in the Highlands and Islands where the concept of “fair rent” is also used. In the crofting situation the Scottish Land Court has said that the assessment must be “unhampered by any element of competition” and was “not attempting to find a notional open market rent”. This means that the reference in the paragraph of the proposal relating to “potential service outcomes”, referring to the demand for allotments is irrelevant. As this forms the basis for the proposal to rack up the annual rents it falls to be disregarded by the Council. A reasonable approach to fairness of rent would be to split the gross margin equally between the parties, which produces an annual rent of £94, with commensurate reduction for half plots and the concessions for those who are disabled, elderly or on benefits. If a comparative approach is taken (which is done in the crofting cases), we note that the Edinburgh rents are already the highest in the country which would suggest that tenants in Edinburgh have not historically benefited from a proper application of the rental provisions of the legislation. In order to cross check our calculation we have adopted a second valuation method. Fairness to the Council as landlords means that while the Council is barred from seeking to make a profit from the rents it should not be obliged to provide them at a loss. This is specifically provided for in the original allotments legislation (the Allotments (Scotland) Act 1892) but is not found in the current legislation. The Council will, however, be aware that similar rules apply in other areas regulated by the Council. The Council’s proposal states that the income from rents for the current year is £80,355. Recently FEDAGA were advised by Cllr. Stefan Tymkewycz that the cost of administering the allotments scheme fell short of that amount by approximately £1,400. His source was Jim Hunter, Acting Head of Service - Environment. We are not in a position to confirm the accuracy of this statement. However, if it is correct, as there are 1429 plots, accordingly the shortfall per allotment holder is less than £1. Thus a fair rent for a full plot, before concessions are applied and properly calculated in accordance with the statutory duty by which the Council is bound falls in the range £94 to £101. We are happy to provide detailed calculations vouching the figures we have set out. FEDAGA acknowledges the voluntary assistance of Mr. Donald Rennie W.S. in preparing this submission. Before he retired from practice as a solicitor Mr. Rennie was accredited by the Law Society of Scotland as an expert in agricultural law. He was heavily involved in litigations and arbitrations about the rents of crofts and farms. On 28th January 2015, the City of Edinburgh Council published "Budget Proposals: Overview of Feedback and Engagement" which gives a flavour of the responses it has had to its suggestions on how it can plug the funding gap. The full paper can be read here.